We have been ever so thankfully flooded with orders for the new Metro-Plex that we have had to forgo accepting orders on our catalog replica titles. For historical interest, we present the information on our Plexi Replica line below. Our Original Flagship Amplifier, the 45/100 is a Limited Edition re-creation of the 1966 era Marshall 100 watt "Super Amplifier" with cast aluminum block ends, blueprinted directly from George Metropoulos's own 1966 Marshall #7206. Truly the Holy Grail 100 watt Marshall, highlighted by the hand machined and polished aluminum chassis. This amp isn't "like" the best classic tones, it IS Hendrix at Monterey, Marshall backline Who at their amp-smashing loudest, Malcolm Young chugging rhythm tones and more. 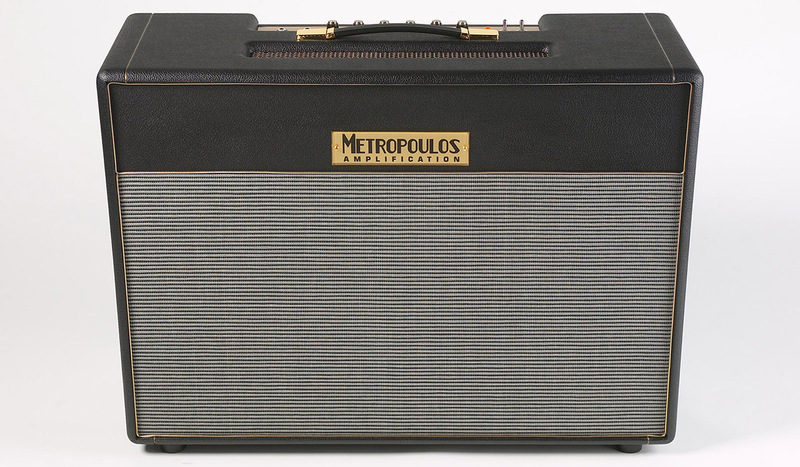 The Metropoulos Amplification 10,000 Series accurately replicates a 1967 era Marshall 100 watt Superlead and Superbass amplifier with serial number in the 10,000 range. Just like the originals, our replica features an authentic reproduction birch headcab, perforated turret boards and a 10XXX serial number. This hand-wired beauty pumps out big organic tone that gets dirty when pushed hard, making it the perfect choice for grinding out Zeppelin, ZZ Top, and Cream style riffage. The distinctive British voicing with EL34 midrange complexity produces classic rock and blues sounds effortlessly. Simply lower your guitar volume control for perfect clean tones. The Metropoulos Amplification 12,000 Series accurately replicates early 1968 era Marshall 100 watt Superlead and Superbass amplifiers with serial numbers in the 12XXX range. Just like original Marshalls, the 12,000 Series offers a more aggressive sound than the earlier 10,000 Series plexi. Special construction details include authentic reproduction birch headcab, perforated turret boards and a 12XXX serial number. The aggressive tone is very midrange focused. Dime everything and you are in "brown sound" heaven. Hit the Virtual Variac™ for even more saturation and spongy feel. The 12,000 Series is also very versatile, anything most classic Marshalls can do you will hear in this amp. Tones from countless albums came from the original 1968 Marshall Superleads and they can all be re-created with our amplifier, including the legendary 1977 debut record from a certain guitar god. *Virtual variac switching is incorporated into a three position standby switch to retain vintage accurate layout and appearance. In the center position the amp is in standby, in the up position the amp operates normally (approx 495V), in the down position the amp delivers only 400V to the tubes. This is to simulate using a variac set to 95V AC input. The Metropoulos Amplification GPM 45 Head accurately re-creates the head version of a 1965 era Marshall JTM 45. The tone is warm and creamy in all the right ways. Fender-y when you want it to be, bluesy when you have to be and authentic 1960's British tones at every turn of a knob. It weeps, it moans and it sings with a vocal voice like no other amp. According to Premier Guitar Magazine, our GPM 45 has "an ease about it that made it feel like a broken-in vintage head, making it a breeze to dig in, or to lay back on the strings and feel the amp act as in instrument. It was truly inspiring. Of all the amps in roundup, this amp sounded the most like our '65 — frighteningly close!" The Metropoulos Amplification GPM 45 Combo in either 2-12" or 4-10" configuration with a variety of speaker options. We recommend the 2-12" combo with a pair of Celestion Alnico Gold speakers for the most classic tone. Our GPM 45 Combo features the same exact chassis and guts that Premier Guitar Magazine raved about in comparison to a vintage 1965 Marshall JTM 45. Emulate the warm and creamy tones that took the world of rock in an entirely new direction when Eric Clapton plugged into one. Copyright © 2018 Metropoulos Amplification. All Rights Reserved.